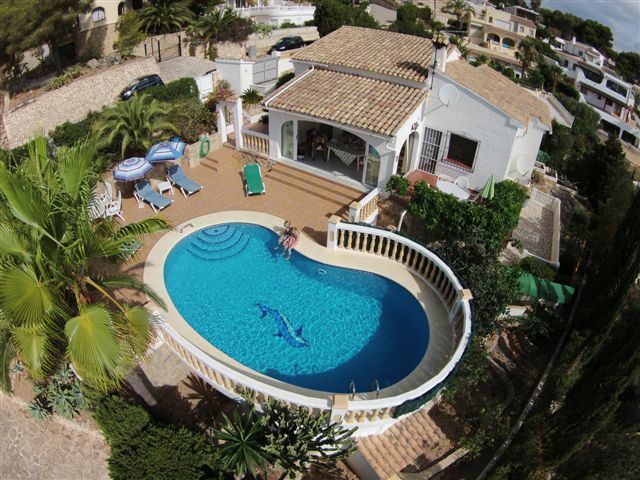 The detached villa, located on a little hill covered with pine trees, has beautiful views over the sea and Moraira. The area is quiet off the main roads with very little traffic only 400 m away from the next supermarket. To the house belong different terraces, including the poolterrace in front of the house, a glazed terrace for days of bad weather, a subtropical garden which is almost completely surrounded by a wall for privacy, a stone barbeque and a carport with a gate. The house (113 sqm) is cosy and completely equipped and furnished in a Spanish-German style with a modern kitchen with dishwasher and utility room. For colder days a central heating, a mobile gas stove and a closed fire place are available. With 2 bedrooms and 2 bathrooms there is plenty of space for 4 persons. In addition the villa has a separate apartment(24 sqm) with a double bed and a bathroom which could be rented additionally for a 5th or 6th person. Pets are not allowed. Further Details: Rental car service, views on village and sea, near supermarket, quiet area, beds for small children available, distance to beach 1.100 m, 1 double bed in the apartment with separate bathroom. We had a really restful and enjoyable break at the villa Los Leudis which comes equipped with everything you already have at home from the excellent quality dishwasher and washing machine (with pegs and washing lines) to adapters, laundry baskets, alarm clock and umbrellas (in the unlikely event it might rain)! The villa itself is very clean and well maintained with reassuringly good locks on all the doors and windows. The gardens are a wealth of vegetables and mature fruit trees and the views are amazing! The owners live nearby and are very welcoming; they were very happy to share with us lots of local information from market days to suggestions for excursions. The property is walking distance (25 mins) to the pretty town of Moraira and there is a local supermarket 5 mins walk away. Be warned - it is a hilly area and take comfortable shoes! We visited Valencia, Denia, Castell de Guadalest as well as spending our final day in Alicante. Tip: take minimal clothes as you can easily wash and dry while you are here. Moraira, a former fisher village, is located at a small cove between Valencia (120 km) and Alicante (100 km), surrounded by little hills covered with pine and almond trees and vines.The city, without any skyscrapers, shows the typical Mediterranean, Spanish environment with many little shops, restaurants, cafes and bars distributed around the yacht harbour. Several beach inlets (sand + gravel) and the hilly hinterland (25 km) offer various possibilities of recreation.